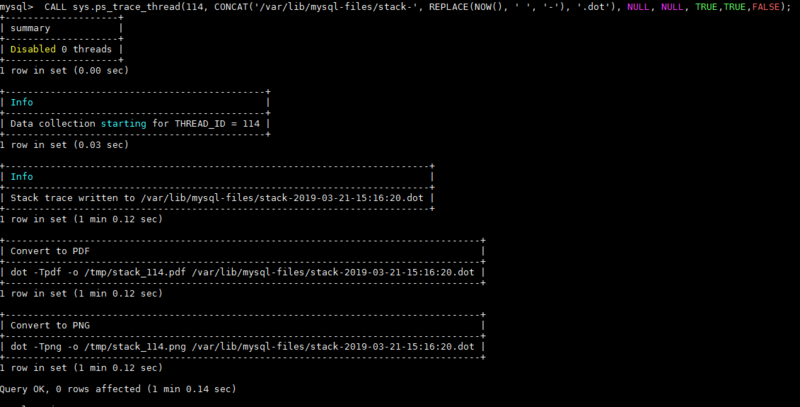 In my last blog post we have seen how we can easily collect general MySQL status information using the sys.diagnostics() procedure. What about a single session/thread ? Is there built-in way to easily trace a target thread/session activity (ex: transactions/ statements/stage/wait events) like using an oracle SQL trace ? It will captures as much information on the thread activity as possible depending on the actual configuration and how busy the system is. The trace log doesn’t have SQL statement, but has more information than 10046 trace. eg, when Oracle acquired a lock (eg, library cache lock), it will not log it into 10046 trace if there is no wait. So I suspect this trace has more impact than 10046 trace does.